AT&T's contribution to the improved overall speed of the iPhone 3GS—their upgraded 7.2Mbps network—is nearly as important as Apple's. But 7.2 is just a number, and AT&T's network is just one of many. Here's where it actually stands. That 7.2Mbps is theoretical, and due to technical overhead, network business, device speed and overzealous marketing, real world speeds are significantly lower. UPDATEDEven looking at the old hardware on the current 3G network—the networking guts in your iPhone 3G is technically capable of reaching the 3.6Mbps downstream that AT&T's network is technically capable of pushing. There are lots of reasons you don't ever see that. For one, it's limited to 1.4Mbps to preserve battery life—the faster you download, the faster you burn that battery. Another is congestion—all the a-holes watching YouTubes around you—and backhaul—the amount of pipe running to a tower, or more English-y still, the total bandwidth the tower has available. Another is proximity—the closer to the tower you are, the faster your phone is gonna fly. 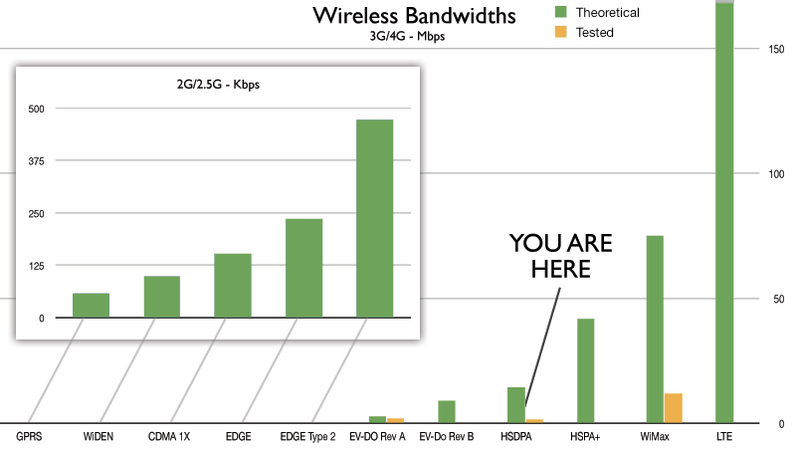 So for top speeds, you should sit under a deserted tower with plenty of backhaul. As you can see on our chart above, our tested speeds for everything from EV-DO Rev. A to WiMax ran at anywhere from one half to one sixth their potential speed. Accordingly, Jason found AT&T's network to run at about 1.6Mbps with the iPhone 3G S—about a third faster than with the 3G, though he was probably still connecting at 3.6Mbps rates—the 7.2 rollout won't be complete until 2011, according to AT&T. AT&T-style HSDPA is expected to reach out to an eventual theoretical speed of 14Mbps, which will undoubtedly make the current 3G networks feel slow, but won't necessarily blow them out of the water. That's the thing: the iPhone, and indeed just about all high-end handsets on the market today, operate at speeds that are reasonably close to the limits of 3G technology. In a funny sort of way, the iPhone 3GS is already a bit out of date. So what's next? And what the hell are those really long green bars up there? Those are the so-called 4G (fourth generation) wireless technologies. Americans can ignore HSPA+ and EV-DO Rev B. for the most part, and given that they're the slowest of the next-gen bunch, shouldn't feel too bad. And anyway, as Matt explained, WiMax and LTE are what's next for us. Both Verizon and AT&T are within a couple of years of deploying LTE in their networks, and WiMax is already out there in some cities. Our own WiMax tests on Clearwire's network peaked at an astounding 12Mbps—nearly eight times faster than the iPhone 3GS on AT&T. And even if WiMax is shaping up to be more of a general broadband protocol than a cellular one, this is the kind of thing that'll be in your phones in a few years, and the promises are mind-boggling: earlier this year, Verizon's LTE were breaking 60Mbps. So in short, your brand-new, "S"-for-speed iPhone is pretty speedy—as long as you only look to the past.